Appirits, the Japanese game developer and publisher recently has marked 6-month running of their English browser-based card & simulation game Shikihime Garden via a big promotion as well as several updates for their players from September 16th to 23th. During the aforesaid period, all available Power packages (a special in-game currency) will be x1.2 their values thus help players have more Power with the same cash as before. Besides, new players joining the game in the event week will be given special gifts to start their adventure. And even if new players manage to reach level 6, they will have more rewards later on! In addition to such promotion, Appirits also introduced a brand new Shikihime race called Ultimate Extremely Rare. These Shikihime cards have stronger stats and growth rate along with unique skills. For this update, certain Shikihime cards can have their max level raised to 20 and unlock a third skill slot to use in battles. Moreover, some new garden ornaments have been also added to enlarge players’ collection of decorations. With regular updates of new ornaments, Shikihime Garden is keeping its players satisfied with its simulation aspect apart from the main card-based gameplay. Though Shikihime Garden focuses more on solo experience, Appirits does not forget players playing in guilds with the increase of guild member up to 32 members for lv.11 guilds. A new Underworld Boss is also released to challenge guild from lv.10 and higher. Plus, a new difficult dungeon is added to the world map to cause trouble to even Shikihime Garden’s veterans. 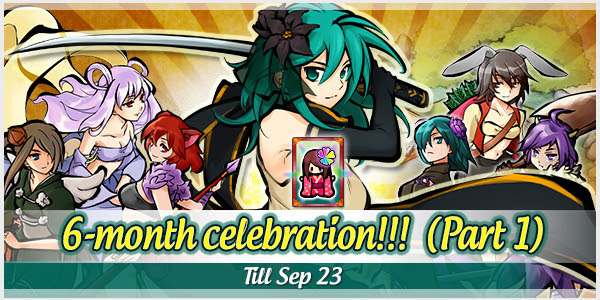 It is recommended that players should join Shikihime Garden especially in this week to celebrate the game’s 6-month milestone with a lot of new content and special gifts.